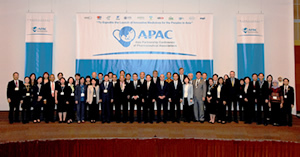 The 6th “Asia Partnership Conference of Pharmaceutical Associations (APAC)” was held on 5th and 6th April with the mission of “To Expedite the Launch of Innovative Medicines for the Peoples in Asia” under the theme of “Accelerating Access To Innovative Medicines through advancing collaborative partnership in Asia”. Keynote Lecture by Boon M.H. ・Both Regulators and Industries will work together to create mutually acceptable Site Master File (SMF) template. ・PMDA will share draft SMF template to panelists and lead the discussion in cooperation with Pharmaceutical Inspection Co-operation Scheme (PIC/S) Vice-Chair. ・Regulators will give feedback to PMDA within 3 months. Industries will give feedback to PMDA within 6 months. ・Advance information sharing, networking and capacity building in drug discovery in Asia by making the best use of established APAC DA-EWG platforms. ・Increase potential of cross-border open innovation in Asia by promoting collaboration initiative using natural compounds and addressing challenges occurred in the collaboration. ・Continue to promote training for further dissemination of Good Registration Management (GRM) and to provide APAC RA-EWG support for better regulatory environment in Asia. ・The Seventh APAC will be held in Tokyo in 2018. At the ATIM (Access To Innovative Medicine) sessions, GMP was on the agenda for the first time. We heard a report on the evaluation process, especially inspections and SMF (Site Master File) / PMF (Plant Master File), from each Asian regulatory authority. At the panel discussion, we were able to clarify different perspectives of each country, and have fruitful discussions for improving the efficiency of our evaluation process. This year, we focused on the use of natural resources as a specific area of drug discovery cooperation in Asia. We have reconfirmed the attractiveness of drug discovery using natural compounds, taking advantage of the abundant natural resources and geographical merits of Asia, and the development of the novel screening technology. We discussed how to implement an efficient and high quality registration process. The GSubP(Good Submission Practice) proposal by EWG and the GRevP (Good Review Practice) by the regulatory authorities have counterbalanced each other, and resulted in GRM (Good Registration Management). It is the great achievement that we have reached the stage where we can discuss its implementation in actual application. Minutes have been provided below.